Developing mutual trust, building mutual respect, and maintaining human dignity. The EM Model for Mutual Influence was designed to help us understand how we best can influence people toward positive and mutual change. No one wants to be changed by someone else. No one wants to become someone's "project." Our goal is not to see a one-way process. We desire to see mutual influence and mutual change. We firmly believe the people we serve on mission trips are not our "mission project." They are valuable creations of God with so much to offer. While it can be obvious that change needs to happen in their community, we believe change needs to happen in us as well. This model seeks to show how this kind of mutual change can best take place. Change cannot be forced, and we know we will not succeed if we try to impose our thinking, values and beliefs on others. We believe there is a better way. As followers of Christ, we become a visual picture of God's love to those we come in contact with. We come to show His love as we care for people. What is our ultimate motive for caring, interacting and sharing our life? Out of love we are able to resist our natural tendency to judge and change others. When we give RESPECT to another person as a genuine act of love it allows us to simply accept them as they are: unique creations of a loving God. Our job is not to change people, but to love them. Once we change our focus from judging others to loving them, we are free from the need to change them and they are free from the pressure that comes from that expectation. The scripture tells us to "Love one another" and also to "Accept one another." How we enter into new relationships within a cross-cultural setting is very important. We come to listen and learn, which begins with an intentional focus that moves our attention away from our own personal interests, values and faith. We must center our attention on another person's world in order to build TRUST. How do they see life? How do they see faith? Our job is not to teach people, but to learn alongside them. Servanthood is love acting in life's relationships. We serve others best by partnering with them, by recognizing what they have to contribute and how our collaboration will bring a better, longer-lasting result while maintaining the DIGNITY and sense of worth of all involved. Our job is not to take care of people, but to serve in partnership with them. As we interact and demonstrate respect for people, the diversity of our lives creates opportunities for reciprocal learning, growth and life change. We have something to learn from everyone once we set aside our personal judgments and cultural prejudices, things we may have previously used to determine a person's worth. Our job is not to change others, but to change ourselves. 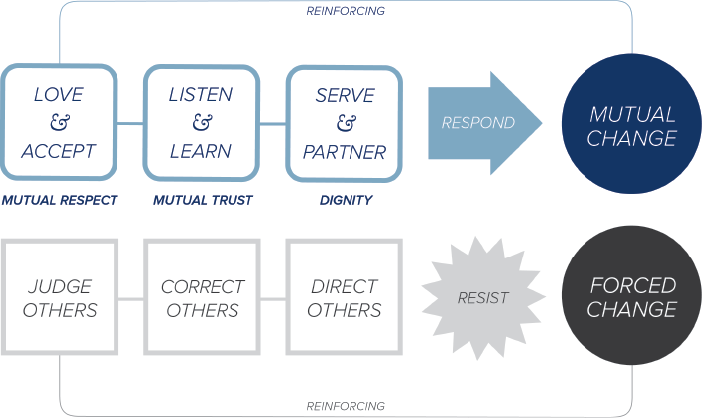 The EM Model for Mutual Influence provides an approach to the important issues of establishing respect and trust when forging new cross-cultural relationships. By understanding the importance of respect, trust and personal dignity, our hope is to avoid forced change and push toward an the influence of growth and change that is mutual among all people involved. Is it possible to serve others in a way that causes more harm than good? At EM we seek to serve others in a way that is sensitive to their personal dignity. We must never enter a needy community with the attitude that we are somehow "superior" to residents there simply because we were born into circumstances that provide easy access to employment, food, shelter and education. It is always important to take time and consider how those we intend to serve might see our efforts. We go to a community to share our time, love and resources with the people there, to work alongside them as brothers and sisters and to spread Christ's love. But we must always keep in mind that when serving people with desperate needs, it can be very easy to make them feel that we're only serving because we have pity on them or because we want to feel good about ourselves. The people we serve persevere in the face of extreme hardships. They are champions, and they should be treated as such. The only difference between us and them is our easy access to resources. Our goal is to develop relationships with mutual feelings of respect and honor. We must be always be sensitive to our posture and our attitude so that when we do offer our resources, others feel the love, respect and dignity they are entitled to as God's children. What steps can we take to remain sensitive to personal dignity? EM projects are designed to encourage partnership between community residents and volunteers who come to serve. Every person involved is encouraged to be both a giving and receiving partner in ministry. In order to demonstrate that we really care, we must treat people with the genuine respect God's creations deserve and be sure they do not feel like "targets." We must continually check our motives for service. We will acknowledge and correct any service that is done in a way that represses others in order to elevate ourselves. We will not simply serve—we will be servants. Often poverty and hardship exist because people lack connections to those with resources. Human nature is such that most people with excess resources are generous with their family and friends, but they are less likely to give without some sort of personal connection. This simple principle dictates that we can assist those in need by enabling them to build genuine relationships built on mutual trust and influence with those who live in abundance. This is the amazing value of a network. Through short-term mission trips, EM partners with many churches, para-church organizations, and nonprofits. We have partnered with volunteers from over 300 churches and organizations in 44 states and over 850 cities. We love that our volunteers come from all over and from all different church denominations and types of organizations. Without this growing network of people going on mission trips, we would never be able to have the kind of impact we desire in the communities where we serve. Our full-time staff and interns come from all over the U.S. and do incredible work facilitating mission trips, developing leaders, and increasing the impact of Experience Mission around the world. Our two headquarters in Seattle, WA, and Fort Wayne, IN, allow us to reach out to volunteers and supporters across the entire country. In urban partner communities, we work with a number of local organizations. In the past, we have worked with: Union Gospel Mission of Seattle, Northwest Harvest Food bank of Washington State, Habitat for Humanity, the Affordable Housing Initiative of Atlanta, Catholic Community Services of Seattle, Catholic Charities in Fort Wayne, the Root Cellar in Portland, Maine, and the Salvation Army of Atlanta, New York, and Chicago. Through its partnership with the Salvation Army, EM Mission Trip teams have touched the lives of hundreds of youth in Colony South Trailer Park in Atlanta's Lakewood neighborhood, and we continue to seek out ministry partnerships and opportunities to serve in other major cities around the U.S.
Current Urban Communities: Atlanta, Georgia; New York City; Portland, Maine; and Washington, D.C. In rural domestic communities, we seek to work closely with a key community partner. In West Virginia, we serve with long time missionaries Jack and Brenda Fultz of the School for Life. On the Navajo reservation, we partner with local pastors and churches to identify projects and accommodate volunteers. Many of these connections were made through Many Waters Mission. Following Hurricane Katrina, EM sent hundreds volunteers to Pearlington, Mississippi, for three summers to assist the Pearlington Recovery Center in relief efforts, and we continue to work with local organizations in Joplin, Missouri, and Moore, Oklahoma, to bring volunteers to help with rebuilding efforts after massive tornados hit home. Current Rural Domestic Communities: Eastern & Western Navajo Reservation; McDowell County, West Virginia; Pike County, Kentucky; Jackson County, Ohio; and Moore, OK. Some of our longest standing partnerships are international communities. In Costa Rica, we work with the Bribri and Cabecar tribes through relationships with the governing council and local churches, and we have also established relationships directly with some remote villages in the interior portion of the indigenous territory. EM currently partners with a local churches in Catadupa, Jamaica, Talamanca, Costa Rica, and Belmopan, Belize, and we work directly with long-standing South African missionaries to serve in African communities. In all of these international communities, we see the biggest potential for growth and truly seeing our philosophies of Mutual Influence in action. We are working to see the visions of these local communities become realties. Current International Communities: Catadupa, Jamaica; Petit Goave & Marchasse, Haiti; Talamanca, Costa Rica; Belmopan, Belize; Cuba; and South Africa. Our vision has always been to have significant impact within our partner communities, and all projects are aimed at this goal. From small home repairs to larger scale community projects, there have been hundreds of EM projects that have impacted our partner communities and their residents. We have also facilitated countless relational connections between people of diverse backgrounds by providing opportunities for thousands of youth, college students, families and adults to step outside of the familiar and become immersed in a different culture. In these experiences, both their perspectives and the perspectives of the people they serve and partner with have been broadened., and our goal is always that everyone is encouraged to return and contribute to their own communities after the trip and time together is over. Since 2003, Experience Mission's mission trips and programs have had an impact on thousands of people, both directly and indirectly. By organizing mission trips and IMMERSION programs, we have had the privilege of connecting people from all different cultures, backgrounds, and socio-economic statuses. This has always been done with the main goal of improving the lives of people who live in under-privileged communities and developing leaders to take on new challenges and spread the hope of Jesus in new ways. We have been blessed to see projects completed and lives changed, and we continue to see the power that building authentic relationships and sharing resources has to make a difference and share the gospel with our actions. We put a large emphasis on developing leaders, and one of the biggest ways we do that every year is through our college-accredited, cross-cultural internship program. EM interns gain invaluable training through real life experience, leading and facilitating mission trips in communities around the world and in the U.S. We give our intern teams total responsibility over the mission trips that take place where they serve, from overseeing construction projects to planning meals and spiritual development time for the teams. This responsibility allows our interns to have a life-changing leadership experience that provides them with skills and confidence to take on more leadership roles after they have served with EM. Cross-cultural interns have gone on to work in other countries and with many other non-profit organizations, building upon a foundation built during their summer with EM. We get really excited when we see where our interns have gone and what they have gone on to do and accomplish. Launching in 2012, our Immersion program is the fastest-growing EM program, sending out 10 participants in 2012, 45 in 2013, and an estimated 65 in 2014. Immersion is different than a week-long mission trip in that team members are able to live directly with community members and experience daily life within a community. They are given opportunities to serve the community as well, but much of the life-changing moments and conversations come person-to-person, building real relationships with people in under-privileged communities around the world. The impact of Immersion is two-fold. Team members come away with an eye-opening experience that will forever shape their future and what they know about the world, and communities are strengthened and encouraged the presence of the teams, who take a real interest in their daily lives and struggles, and share the hope of Jesus through their actions.